Is your kiddo fascinated by ancient civilizations, the Roman Empire in particular? Well, then we’ve got the perfect costume for your little girl this Halloween! 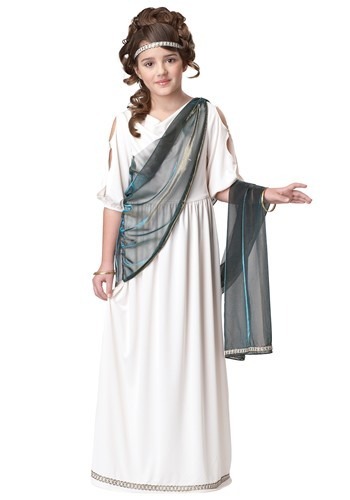 Transform her into Roman royalty with this Roman Princess Kids Costume. She’ll be so grateful for the opportunity to live out her dream of ruling an ancient empire that she may even make you one of her most trusted advisors! Quite the step up for your day job, ay? This lovely costume comes with a majestic ivory pullover dress and the beautiful headpiece. The elegant blue/gold sash is attached at the left shoulder and right hip, so your little princess won’t have to worry about adjusting it all night. She can enjoy running around the dance floor with all her friends and her royal subjects. Enrich her experience with some fun accessories. Grab some gold bangles and a pair of roman sandals. Maybe even a gold laurel leaf crown! That would really let everyone know who’s in charge. You could also take this costume to the next level. Why be Roman Royalty when you can be a Roman Goddess? That status can easily be achieved once you grab one of our goddess wigs and a pair of golden sandals, and then BAM! You’ve got yourself a goddess. Help your kiddo rule over Ancient Rome as royalty or protect the empire as one of its many goddesses with this Girls Roman Princess Costume. Whichever path she decides to take, one thing will be for sure. She’ll have a most memorable Halloween experience in this beautiful ensemble!